The lovely Mr. and Mrs. Werner are off on a honeymoon sure to be full of adventure, and leaving shortly thereafter for their first post in Georgia. In standing tradition from my other sister's wedding, here are ten rambling stories from a day that we all will never forget. 1. 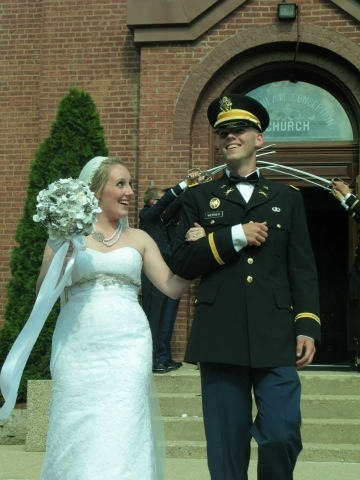 Em is an Army wife now, and she is excited to become a part of the military life and culture. 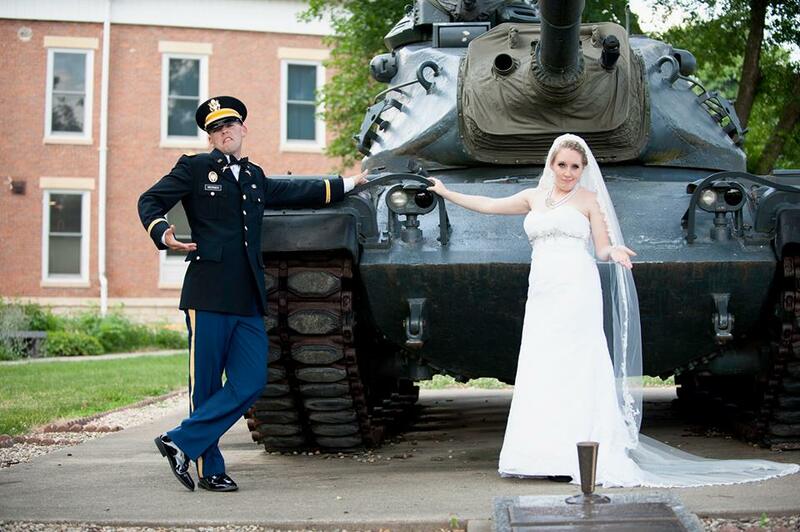 It certainly added some fun elements to the wedding, including (of course) all of the handsome young men in uniform, a saber arch exit from the church, wedding photos at the tank at our local courthouse, and a serenade Top Gun style at the reception. 2. We just got Steph and Steve hitched last November, so essentially we have been planning two weddings at the same time over the past year or so. 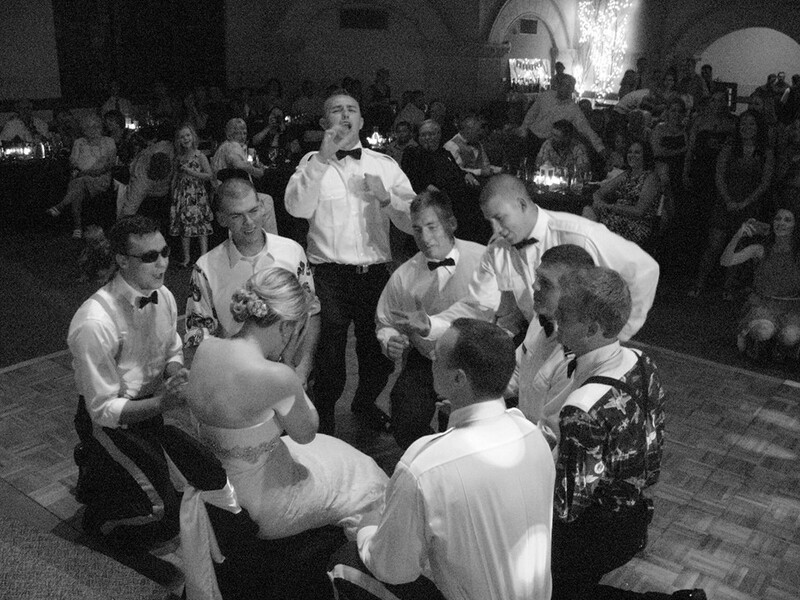 People who had been at S&S's wedding kept saying things about how they were so excited to see what the Bogner family had come up with this time. I also heard Pinterest used as a noun, verb, and adjective while people commented at the reception. As in, "Wow, Pinterest has got nothing on them" or "You can just see the Pinteresting everywhere" and "I hope you Pinterested all of this because I am stealing all of your ideas for my wedding." 4. 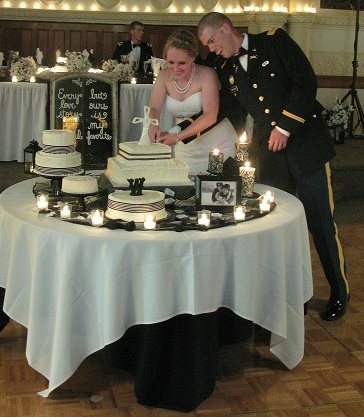 One of the many hands on elements at the wedding was the wedding cake. My mom made them, just like she made S&S's. She has been decorating cakes for our family as well as lots of other people since we were all little, so it is no surprise that she wanted to make them for the weddings, both out of sentimentality and frugality. Look at how beautiful they are! 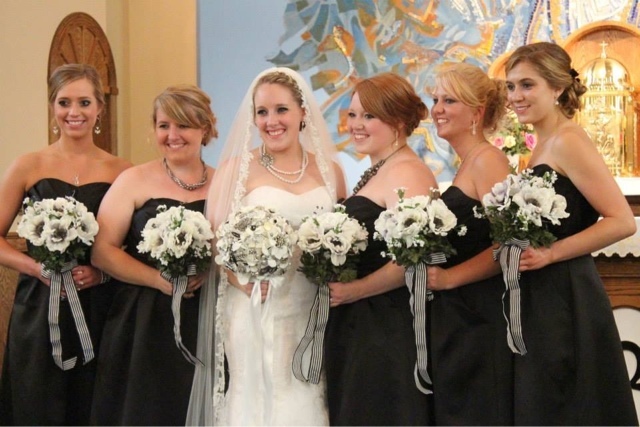 She does a phenomenal job, and was so selfless with her time and hours of sleep in the days leading up to the wedding. I, however, being a brat, have told her for a long time that under no circumstances is she making my wedding cake. First, I don't want her stressed about it, because cake has to be made just beforehand. Second, I don't even really like cake. At all. I would much prefer apple pie or scotch-a-roos. 5. 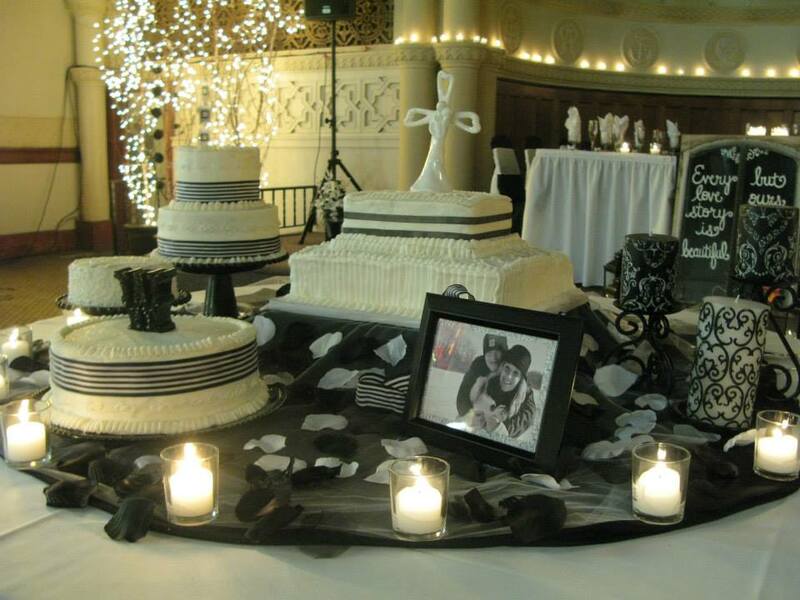 Anyways, S&S's wedding cakes went off with nary a hitch. E&L's however...well, things got a little dicey. Literally. We had some cake catastrophes that my mom handled wonderfully on the outside, and she made the best of it, worked super hard, and ended up with these lovely and delicious cakes to show for it. 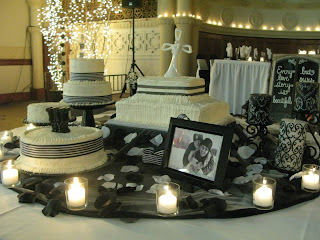 However, at around 1 a.m. the night before the wedding as she, Steph, and I all were working to repair and decorate the cakes, she very solemnly said, "You win. I am not ever doing this again." So mom, it is here in writing. Published on the internet. And hopefully in a year or two when it is my turn to plan, I can hold you to it. 5. Many people may be thinking, "Katie, it must be hard to be single and watch both of your younger sisters get married before you!" Wait, people aren't just thinking that. They are asking me. all. the. time. The real answer is that of course I want to be married. Unless God changes my heart, it is my desire to be a wife and a mom and I have prayed for years about His vocation for me. It just hasn't happened yet, but I will be faithful to Him and will wait for His time. The addendum is that I want joy filled lives for my sisters and nothing has made me happier than to watch them find the men that God made for them, the men that will care for and protect them, the men that are leading them to be the best versions of themselves. And I have loved adding two brothers to our close knit family. I can't imagine us without them. 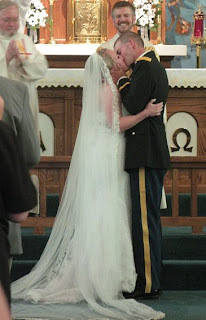 "First, Emily and Luke are so glad that you have joined in this special day with them. After they process out of the church, please follow the directions of the ushers so that you can help send them off. They look forward to seeing you at the reception in Peoria. Second, gentlemen, there is only one Bogner sister left, and they are going fast. So- time to get to work. The Lord be with you! (And with your spirit) May Almighty God bless you, the Father, the Son, and the Holy Spirit." At the reception, I had several people comment that they were unaware that my face could turn that particular shade of red. oh. my. goodness. 7. 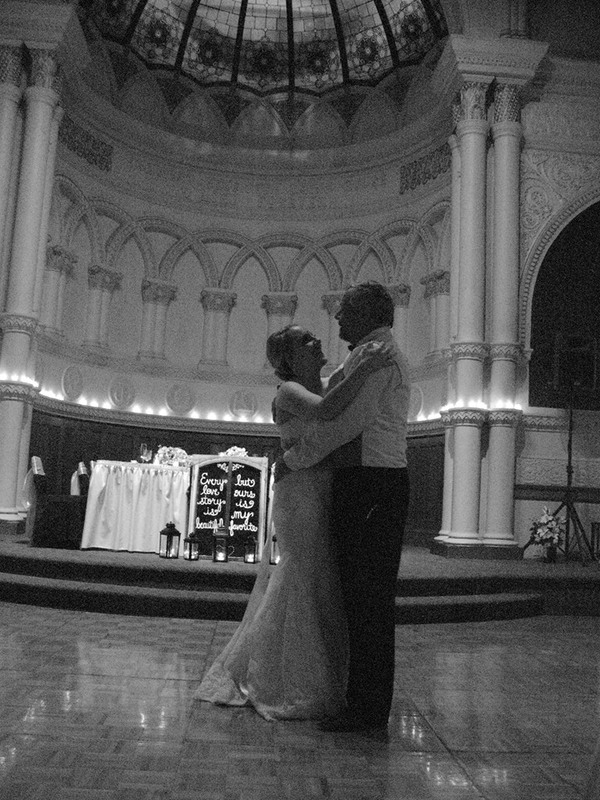 I think that my dad would be perfectly content if I never got married. He wants us all to come home and move back into our bedrooms upstairs. No, I am just kidding- he loves having sons-in-law to come work in the shed or drive tractors with him. Our 4 to 1 female to male household ratio is slowly balancing out- we are at 4 to 3 now. And he has also commented that he is excited to be a grandpa (someday- no announcements in this post! ), which I know that he will be great at. 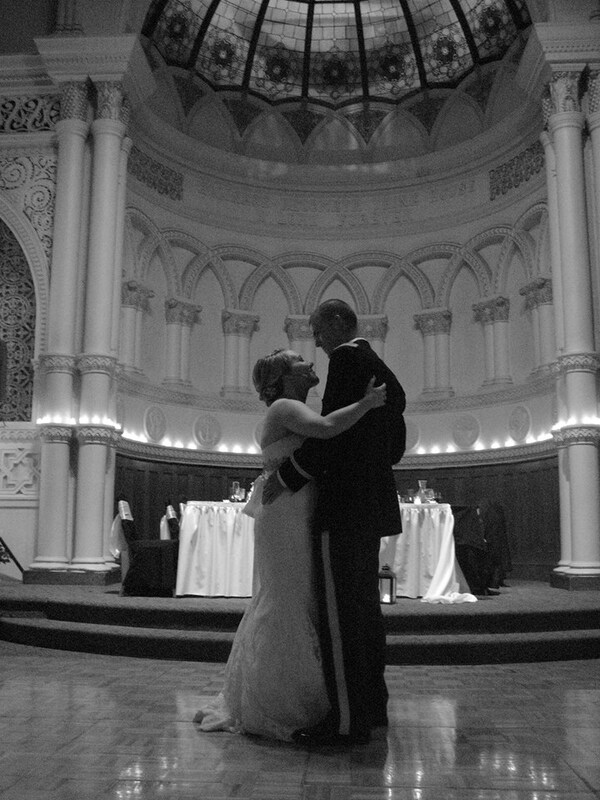 The part of the day that I had the hardest time keeping my emotions in check was leaving Em in the back of the church with my dad, and then watching them walk up the aisle. She had kept tears at bay all day until then, but she was all teary and choked up about five steps in. Then my dad, being awesome, made a "hushed" whisper to her that there was still time to run, which made her laugh hard enough for the whole church to hear. That got everyone smiling, and the wedding started without all of us collapsing into puddles of mush- Dad to the rescue. Stephanie later told me that she held it together using an interesting technique. Every time she felt tears coming on, she sang Thrift Shop in her head, which stopped sadness immediately. Everyone has their own coping strategies, I guess. 9. We welcomed Luke into the family with this awesome circle of trust tshirt, which stems from a long running inside joke between all us siblings. Luke has drawn stick figure pictures of him struggling to join our "circle of trust" aka into our inner sibling closeness. He made Steph a shirt at one point, so we gave him this one as a wedding gift. We are glad to have another brother! to pray together just before. 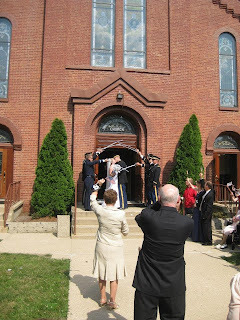 They closed their eyes and let us lead them each to one side of a corner of the church. 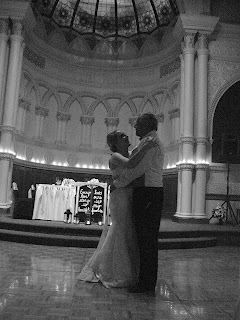 They reached around the corner to hold hands and prayed together for the last time as single people. The Mass was richly full, from the stellar homily to the Marian offering to the obvious focus on what Christ had done for them. There were little touches of Scripture at the reception, and the music that they chose shared God's role in the love they share. It has been a privilege to witness the courtship and marriage preparation of such a holy couple, and I look forward to seeing God continue to work in their lives as they witness true Christianity to all around them through their marriage. Em and Luke, I love you both!